Large coniferous trees with an open airy habit. Tough and wind-resistant, these unusual evergreens make excellent specimen trees. Foliage: Glossy, dark-green, overlapping scale-like leaves, that cover the upturned whorled branches from tip to trunk. Evergreen. Cones: Male trees produce clusters of downward hanging cones (catkins) while female trees have upward-facing round cones. Soil: Deep, moderately fertile, well-drained soil (chalk, sand or loam). Acid, alkaline or neutral pH. Conditions: Plant in full sun, in either a south, east or west facing aspect, in an exposed or sheltered location. Hardiness: Only A. araucana is fully hardy in the UK once established (down to -20°C). Plant container grown specimens in the spring or autumn. Choose a sunny position and well-drained, deep loam. These evergreen conifers don't like to be moved or transplanted, so choose your site carefully before planting. 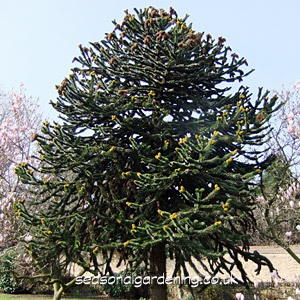 Araucaria can eventually grow to a mature height of around 70ft (21m), so they are not recommended for small gardens. Shelter young plants from cold, drying winds and full sun until well established. Take tip cuttings of vertical shoots in summer and root in a cold frame. Propagation from seed is not practical in the UK as it requires both a male and female tree to produce fertile seeds. A. araucana is the only species hardy enough to be grown outdoors in the UK. Average mature height 60ft (18m), spread 30ft (9m). Available from You Garden and Gardening Express. A. araucana 'Aurea' is an attractive cultivar with yellow variegated foliage. A. heterophylla (syn. 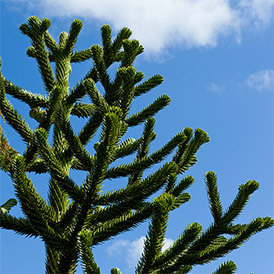 A. excelsa) (Norfolk Island Pine) has distinctive whirled branches of fan-like foliage. Young plants provide an ideal specimen for the cool greenhouse or as a house plant (not hardy in the UK). Available at You Garden.